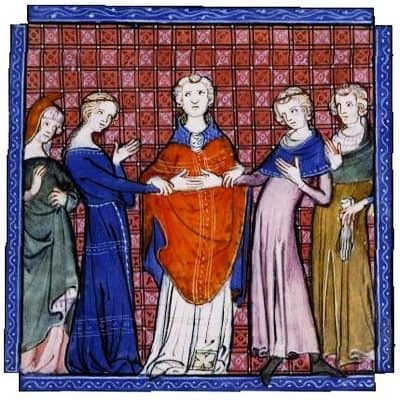 In 1262, a very young princess named Constanza was wed to Pedro of Aragón. He was twenty-three, she was thirteen. He was a proven soldier and leader of men, having spent many of his formative years riding side by side with his father, Jaime I of Aragón, as the latter spearheaded the Reconquista. (The Reconquista was the movement whereby various Catholic king on the Iberian Peninsula reclaimed “their” territory from the Muslim kingdoms that had flourished on the peninsula since the 8th century or so). Constanza was all of thirteen. She was also the eldest child of Manfred of Hohenstaufen, King of Sicily. The throne of Sicily was not exactly secure. Manfred and the pope were at loggerheads and the pope sorted the issue by excommunicating Manfred and offering the Kingdom of Sicily to whoever would buy it. Not, I hasten to add, something the pope had the right to do, but you know how it is with men and power: sometimes they’re blinded by their own vainglory. And, to be fair, the pope could argue that Manfred’s claims on Sicily were somewhat tenuous. After all, Manfred had walked roughshod over the claims of the rightful heir, his own nephew Conradin. 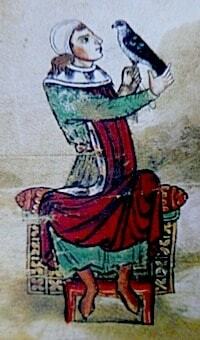 Anyway: one potential buyer was Richard of Cornwall, Henry III’s younger brother. After some thought, Richard turned down the pope’s offer. This may have had something to do with Manfred’s reputation. Other than being considered drop-dead handsome and incredibly cultured, this gent was something of a mover and shaker, having overcome the stigma of his illegitimate birth to rule most of southern Italy and Sicily. On several occasions, Manfred had clashed with the Church. 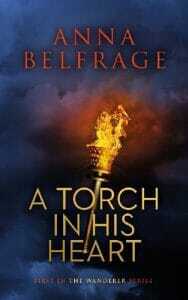 On several occasions, he’d defeated the papal armies sent out to destroy him. He’d goaded the pope further by supporting the Ghibellines. 13th century Italy was a hotbed of conflict: In the northern part of this our favourite geographical boot, the Ghibellines sided with the Holy Roman emperor while the Guelphs were firmly on the side of the papacy. Seeing as Manfred’s father had been Frederick II, Holy Roman Emperor, it’s sort of logical he’d support the Ghibellines. We will get back to Charles of Anjou and Manfred shortly, but let us first return to that June day in 1262 and the rich town of Montpellier, where Constanza of Sicily met her husband for the first time. 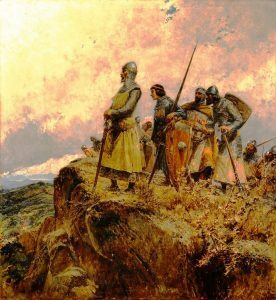 Why Manfred was eager to promote this marriage is obvious: he needed support in his ongoing conflict with the pope, and the kingdom of Aragón was a powerful player not only in the north-east of present-day Spain, but also well into Provence. The benefits to Aragón were less obvious, but Jaime I had expanded his kingdom into the Balearic Islands and the region of Valencia, and what he needed was access to safe trade routes. Whoever controlled Sicily, controlled a lot of the trade routes in the Mediterranean. At the time of the wedding, Constanza was Manfred’s eldest daughter. But Manfred had more children. In June of 1262, Constanza had three half-siblings, two of whom were baby boys. She was therefore not an heiress to a kingdom, she was just a young girl of good pedigree with a legend for a father and a generous dowry (albeit Manfred was not in a position to pay it all). But things were about to change—dramatically. Charles of Anjou rode into Italy accompanied by 30 000 soldiers. As he rode south, he razed Ghibelline strongholds to the ground and reinforced the rule of the papal states, which probably had the pope skipping with glee. Further south, Manfred girded himself and prepared. He may not have had as many men, but this was his land, his people, and he was prepared to die defending it. Turns out he did. At the battle of Benevento, Charles defeated Manfred who died on the battlefield and was buried where he died, a mountain of rocks piled on top of him. (In due time, his remains were transferred elsewhere for a more appropriate burial). Charles was a happy camper. King at last! But while he’d got rid of Manfred’s sons and youngest daughter, one daughter was still at large: Constanza. In one fell swoop, our little princess was now the legitimate heir to the Kingdom of Sicily. More importantly, she had recently given birth to a son, Alfonso, so now she (well, her husband) had every reason to push her claim. 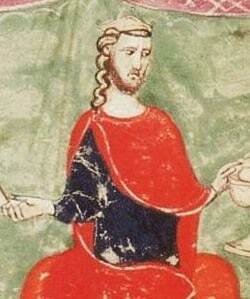 In 1268, Pedro was still a royal heir. His father was very much alive and while he was all for adding Sicily to the Aragonese dominions, he was hesitant at doing so at any cost. After all, Aragón was not strong enough to take on France on its own. Instead, he urged his son to utilise subversive methods. Pedro had men—and especially one man, a certain Juan de Procida—travel through the Kingdom of Sicily and foment rebellion and dissent. Charles was nothing but a ruthless conqueror, Juan murmured to whoever would listen, a papal agent who had as his ultimate agenda to browbeat the proud Sicilians into submission before the Holy See. The Sicilians weren’t all that thrilled. This was an old kingdom, a melting-pot of various cultures that considered itself far more refined than those boorish louts up in Rome. Also, the ancient affiliation to the Holy Roman Empire ran deep, and Charles of Anjou was viewed with deep-seated suspicion. All good news for Pedro and Constanza, but the thing with subversive methods is that they take time. A lot of time. Still: we all know that revenge is a dish best savoured when cold. In 1276 Jaime I died. For some years, Pedro III had his hands full with pacifying his new kingdom, bringing his nobles to heel and in general putting his house in order. For some reason, Jaime I had decided to divide his various holdings between his eldest son, Pedro, and his second son, also a Jaime. I imagine Pedro found this frustrating. How else to explain that he in 1279 forced his brother to accept Aragón as his overlord, making Jaime, as king of Mallorca, effectively a vassal of Aragón? Other than handling his brother, Pedro also had to spend time reinforcing his hold on Tunisia, a Moorish kingdom that had declared itself free of Aragon’s control upon Jaime I’s death. Pedro set about preparing for war and sent to the pope, asking that he declare Pedro’s venture a crusade against the perfidious Muslims. The pope refused, probably at the behest of the French. Pedro probably did some teeth-gnashing and creative cursing directed at the Vicar of Rome and in 1282 launched his navy, determined to teach the Tunisians a lesson. Halfway there, a message reached him: the Sicilians had risen in rebellion (known in history as the Sicilian Vespers) against Charles de Anjou and needed his help. What had started as a skirmish between a French soldier and a Sicilian over a woman had quickly turned very nasty, with the Sicilians murdering any Frenchman they could lay hands on. Charles de Anjou was determined to restore his rule to Sicily. The Sicilians were as determined not to let him, hence their appeal to Pedro. Well, what’s a man to do? Pedro redirected his fleet, more than capably managed by the exiled Sicilian Roger de Lauria. What followed was a sequence of humiliating naval defeats for Charles, a couple of lost skirmishes, a dogged effort by Pedro to claim piece after piece of Charles’ kingdom. So unnerved was Charles by Pedro’s success, that he suggested they sort this in a duel. Pedro accepted, but the whole thing became something of a farce—neither man had any real intention of doing battle to death. By 1283, Pedro had most of Sicily under control. By 1284, Charles de Anjou was on the defensive, one of his sons having been defeated at yet another naval battle and he himself obliged to lift a siege due to the sudden appearance of Roger de Lauria in his proximity. As an aside, this Roger was quite the warrior. Not only was he an extremely capable admiral, he was just as skilled at war on land. Pedro, however, was discovering the dangers of over-extending yourself. With him busy in Sicily, his unruly barons took the opportunity to push for reforms, or else they might do some revolting of their own. His younger brother Jaime decided he preferred doing homage to the French and invited the French king to be the overlord of Montpellier. And then there was the pope, an ardent supporter of Charles de Anjou. Pedro was excommunicated, proclaimed “unkinged” (yet another thing the pope could not do) and our French-born pope offered the crown of Aragón to Charles de Valois of France. Clearly, Pedro needed to get back home ASAP. The French invaded in style. Over 100 000 foot-soldiers, a cavalry close to 20 000 men strong and the whole thing was led by the French king himself, Philippe III, ably supported by his son and heir, Philippe le Bel. The French entered Girona and Charles de Valois was even crowned king. I imagine our not-so-dear friend the pope cackled with glee. Once again, Roger de Lauria sailed to the rescue. Just off the Catalan coast, his 30 galleys did battle with the French-Genoese fleet. 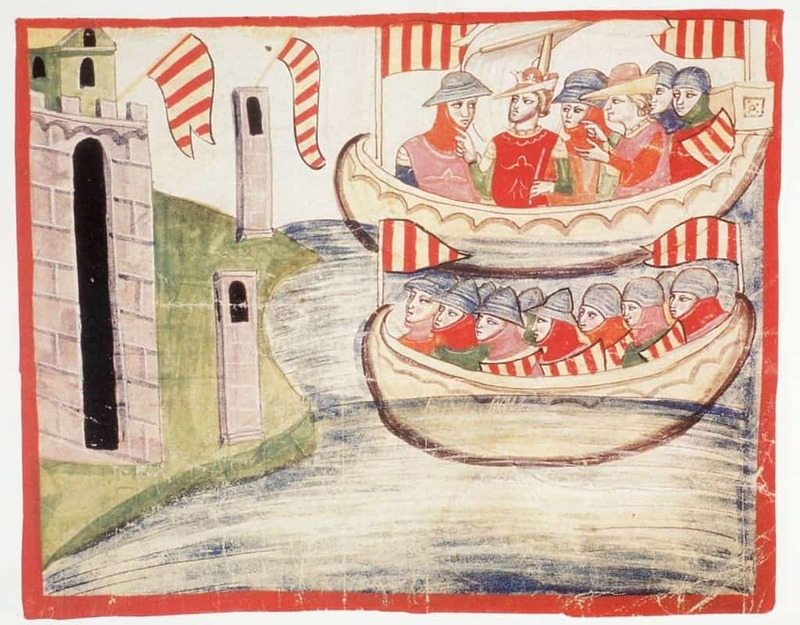 While the various accounts vary significantly as to what really happened, they all agree on two things: the battle was fought at night, which was unusual in medieval times but suited Roger who (obviously) was skilled at night-time fighting and two, the French-Genoese fleet was crushed, more than half the ships sunk or burned. There is also a rather lurid tale in which the three hundred Frenchmen who were captured all had their eyes gouged out—all but one, who was allowed to keep one eye so that he could guide his companions back home. Maybe this was payback for Manfred’s poor children. Or maybe it didn’t happen. Meanwhile, Pedro had now returned home and assumed command of the army assembled to drive the French out. Off he marched, his banners snapping in the wind, and in 1285 he drew up his forces in front of the French. By then, the French had other problems. One could almost thing God was not with them on this venture, how else to explain that not only had their fleet been recently crushed, but now the entire French army had been afflicted with dysentery. Philippe le Bel begged Pedro to allow the French royals free passage back home. Pedro graciously acquiesced. After all, no matter how upset he was with them for invading his lands, they were family, Philippe le Bel being the son of the French king’s first wife, Isabel, who was Pedro’s sister. He had, however, no intention of being as lenient with the French troops. As the tired and sick Frenchmen began their journey through the Pyrenean pass of Col de Panissars, the Aragonese army fell upon them. The French died like flies—according to Pedro a necessary measure to safeguard his realm from future French attempts to take it. Some months later, both Philippe III of France and Pedro of Aragón were dead. Philippe succumbed to dysentery in Perpignan. Pedro is assumed to have died of some sort of pulmonary disease. And so we are back with Constanza. 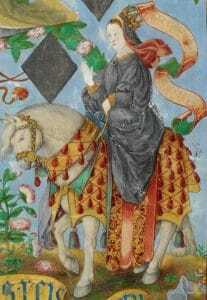 November of 1285 and the man she had married all those years ago was dead, leaving her a widow at not yet forty. I imagine she grieved for her man. But I also think she took ferocious pride in the fact that thanks to her Pedro the land of her birth was back where it belonged: under the control of her family. It would remain there for quite some years to come. I bet Manfred would have been pleased!